It is the only modernist house with three main entrances and facades. Its location in the heart of the Diagonal, almost touching the Passeig de Gràcia, makes, day in day out, in order to lovers of modernism in Barcelona pilgrimage. Along with the house Amatller is one of the great works of the architect Josep Puig i Cadafalch in Barcelona. It is popularly known as the home of the six towers “Punxes “shaped tip that crown the terrace, inspired by French Chateau de Pierrefonds. A declared in 1975 National Historic Landmark, starting next summer, it will open to the public house, adding to the list of visitable modernist jewelry, among which also will be from 2017’s first home entity built Antoni Gaudi Barcelona Vicens. 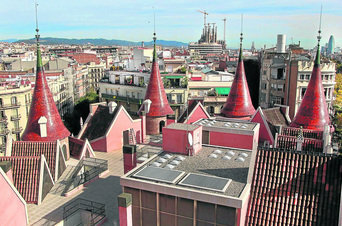 With an investment of three million euros, currently it is carried out an interesting project of rehabilitation to recover and to value the essence of the work of the House of Punxes, a building constructed between 1903 and 1906 commissioned by the Terradas family (until recently erroneously wrote Terrades, and even a plate of the Government in one of its facades perpetuate the error, now corrected by Isabel Artigas art historian, author of the research project). It was to build a single house to bequeath to each of the three daughters Terradas, Angela, Josefa and Rosa, in an irregular and unusual land remaining between Rossello Bruc and Diagonal streets, the result of the recent urbanization of the Eixample . The proposed Puig was an interesting project medieval air that unified the three apartment buildings in a single building block, giving the appearance of a single house. Current works affect the ground and first floors of the building occupied by the number 420, located at the confluence of the Diagonal and Rossello, the most notorious and photographed by tourists who are en route to the Sagrada Familia. “We are basically doing cleaning of stays to recover the essence and main features of the original building,” says Jaume Falguera, the architect in charge of the work. Downstairs, after eliminating dividing walls and ceilings, the resulting open space revalued the original columns which the architect introduced to replace bearing walls as one of the most outstanding contributions of his time. Although not yet defined the specific project visit will take place and the items to be exhibited to contextualize the work of Puig i Cadafalch, there are aspects that are already clear, and the ground floor will be mainly for shop and reception bar area. From here you will be accessed by a staircase of new construction to the first floor, which will follow the route up to the terrace indoor elevators, the most spectacular part of the tour. “We want to prevent visitors from interfering in the daily life of the tenants who are still on the floors,” Fern said. Figure among neighboring Austria sales office or consulate Quebec. This will prevent mass transit visitors through the gates, parts of the building with the facade and terrace of the highest artistic value, and use the original lifts, also cataloged. Among the illustrious residents who have passed through the house Terradas Figure Eugeni d’Ors, who is said to have spent entire afternoons in the main Punxa, the greatest of all, which now also proposes allowing the visit, although restricted, since it is the one that brings the most spectacular view over Barcelona and on the terrace itself, which are the three houses of the gatekeepers between bunkers which currently house the air conditioning apparatus. They are spaces that, along with the rest of Punxes, will be visited starting next summer and have served until now as offices signature photography, design and art, and even seen some of the most legendary parties of the city famous by a hopeless “vivales” which ended baptized in social networks like Count de les Punxes. But that is another story.